Geezers leave town: Mike Cavanaugh and Alan Mapes ready to leave the Northeast and 20 degree weather. Northeast winters are awfully long for an obsessed kayaker, but I’ve found a solution. My buddy Mike Cavanaugh and I will tie the boats on an SUV, hook up a small camping trailer, and drive south – as far as it takes to find warm waters and sandy beaches. We camp at state parks, eat good seafood, and paddle nearly every day. Let me share some of our favorite places to paddle and camp, along with some tips for enjoying the experience to the max. We started these month-long trips in 2009, sharing our adventures with friends and family through an online blog and later on Facebook. Needing a title for our trips, we dubbed them “Geezers Go South.” We were only in our late 50s when the trips started, but the “Geezer” moniker seemed to fit – we are not in a hurry, going where the weather and good paddling takes us, visiting friends along the way and making some new ones. Mike and I are both married with grown kids. So how do we get away with this? Both of us have retired from full-time work, so our part-time jobs give us the freedom to take four or five weeks off. The ‘family leave’ comes thanks to our understanding wives. They often join us for a week or ten days while we are in Florida or the Gulf states. They fly down and we bring kayaks for them. A fun wrinkle of our travels involves eating – we like to! On our first Geezer trip, we were depressed to see all of the chain restaurants along I-95 and we vowed to avoid all chain eateries. We’ve had great experiences seeking out locally owned restaurants and watering holes. We often take kayaking classes as part of these trips. 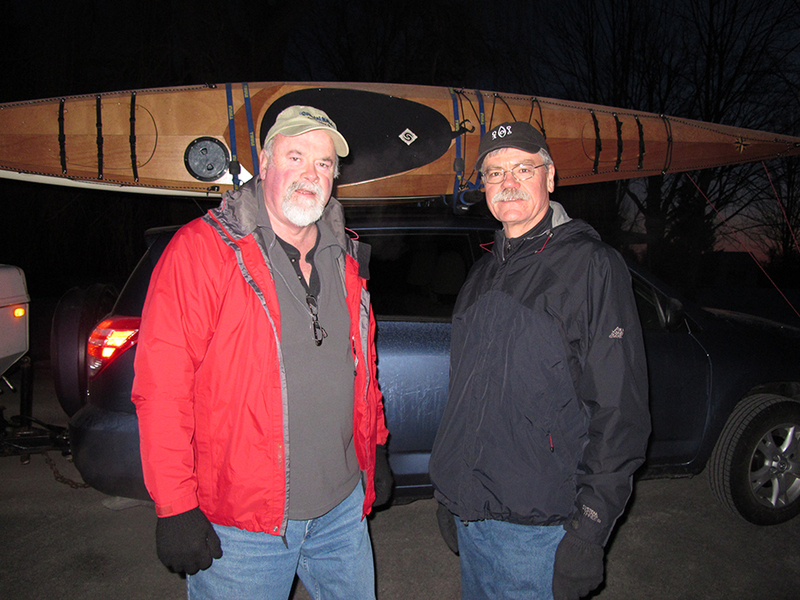 In the process, both Mike and I have become certified kayak instructors through the American Canoe Association. We find it important to continually improve our skills with paddling and instructing techniques. Charleston, S.C. The town is surrounded by water and the whole coastal plane, or “low country” offers a series of marshes and slow, winding rivers – excellent for paddling. Places we’ve paddled include the Edisto River from Givhans Ferry State Park, the Folly Beach marshes, and Deveaux Bank Island – timing the tide currents is important for this location. Georgia Islands and Okefenokee Swamp. We camp at Crooked River State Park and have paddled the areas of Cumberland Island, Jekyll Island and Amelia Island. An hour’s drive inland, a paddle into the Okefenokee Swamp from Folkston, Ga. is a real treat. Lots of showy birds and sleepy alligators are there to greet you. Indian River near Sebastian Inlet, Fla. We stumbled on a great county park to camp at – Long Point Park near Sebastian Inlet. The Indian River lagoon is wonderful shallow warm waters full of dolphins and pelicans. We launch the kayaks right from our campsite, as most are right on the water. Myakka River State Park, Fla. If you like birds, alligators and wild pigs, this park is for you. Paddling here is a bit challenging due to shallow waters, but the wildlife watching is terrific! The tram and airboat rides are great ways to see the wildlife up close. Homosassa Springs and Crystal River, Fla. The Gulf Coast of Florida, north of Tampa, is a big favorite of ours. We stay at Camp ‘N’ Water private campground in Homosassa Springs, launching right from there into the Homosassa River. Nearby is Kings Bay at Crystal River, a great spot for seeing manatees and dolphins. Nearby we’ve paddled the Chassahowitzka River, Mason Creek and Ozello. Be sure to visit “The Freezer” for peel-them-yourself shrimp and dollar drafts. Cedar Keys National Wildlife Refuge, Fla. From the quaint, remote village of Cedar Key, we visited a string of islands that make up the refuge. Dolphins, terns, black skimmers and pelicans will keep the journey interesting. St. Joseph’s Peninsula State Park, Fla. If you like remote, quiet areas, the Florida Panhandle is a region to check out. The bay side of this peninsula offers protected waters and is reputed to be a great for fishing. Town is five miles away, as the crow flies across the bay. If the crow has to drive, it’s closer to 25 miles! Gulf Islands National Seashore, Ocean Springs, Miss. We stay at Davis Bayou Campground – part of the national seashore – paddling through the bayou marshes and around nearby Deer Island. Delmarva Peninsula, Kiptopeke State Park, Va. Closer to home, we enjoy the Chesapeake Bay area as we head back north in the spring. 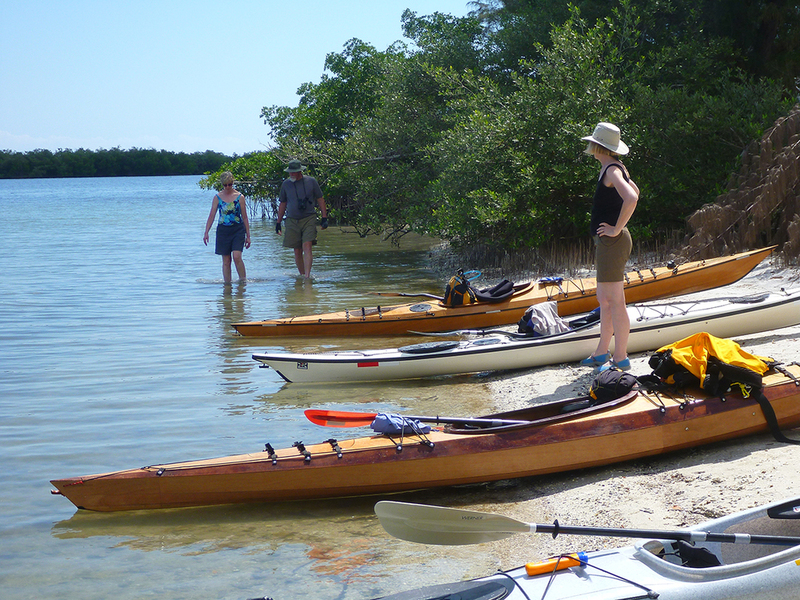 Check online for the Kiptopeake Sea Kayak Symposium, a wonderful event, held in late September and offering classes for all skill levels of paddlers. If you go – We find that campsites in the south can be hard to get on short notice. Making reservations months in advance does not fit our wandering Geezer travel mode, but are needed, especially with a trailer. The $20 a night state park campsites get booked up by the $100,000-plus motor homes! If you camp with a tent, it’s easier to find sites on short notice. For people not on a flexible time schedule, there is the option of flying to a southern destination and renting boats, or booking kayak guided tours. Look online for paddle shops that provide the services you need. As with paddling anywhere, safety is paramount. Conditions are often quite serene when we paddle in the south, but winds, waves and tidal currents can be an issue along the coast. It’s best to go with an organized tour group if you are not experienced. We paddle well-equipped kayaks and we are up-to-date on our safety and rescue techniques. Mike and I always wear our life jackets, though many people down south do not. We use caution around any wildlife, taking photos, but keeping a safe distance from alligators, snakes and any other critters and we have never had a problem. Are we running out of new places to paddle after seven years of Geezer trips, you ask? Heck no! There are hundreds, maybe thousands of great places that we’ve not yet paddled, just in Florida alone. How do we find out about wonderful places to paddle? · Online resources like paddling.net will give you detailed information on launching sites and paddle trips. · Paddling guidebooks are available for various sections of the Atlantic and Gulf Coasts. · Small kayak and canoe shops are run by people who are passionate about exploring with small boats. Talk to the staff and they will guide you to the best spots. Two of our favorite shops are Sea Kayak Carolina in Charleston, S.C. and Sweetwater Kayaks in St. Petersburg, Fla. Shops like these conduct guided tours and provide boat rentals for pale northerners like us.